PRODUCT: SAE, flat washer 1/4 inch, 0.065 inch thick, steel, zinc finish. 100/bag. Price/bag. APPLICATIONS: Flat washers are used typically under the head of a bolt or a nut to distribute the foces applied when tightening. For Use With Screws and Bolts. 3/8 INCH ID FLAT ZINC STEEL WASHER, SAE GRADE. 100/BAG. PRICE/BAG. 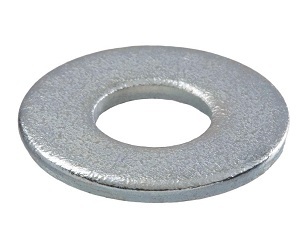 USS, FLAT GALVANIZED STEEL WASHER 1/4 INCH, 0.065 INCH THICK, STEEL, ZINC FINISH. 100/BAG. PRICE/BAG.